The CB Group UWI 5K and Smart Eggs Kids K 2018 Press Launch took place on Monday, October 1, 2018, 10:30 a.m. – 11:30 a.m. in the UWI Regional Headquarters in the Ramson Room. Heartiest Congratulations to the MSBM students who are scholarship recipients. 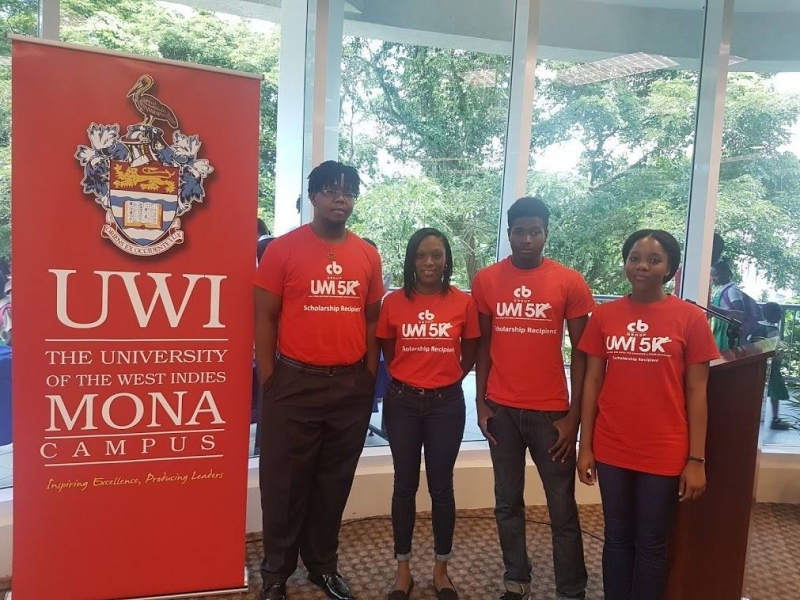 Pictured above:(L-R) Oshanie Levy (BSc Mgmt Studies), Sabrena Johnson (BSc Banking and Finance), Romario Bartley (BSc Accounting), and Tomoy Nembhard (BSc Accounting). Sabrena Johnson is currently a final year student in the Faculty of Social Sciences where she is pursuing her Bachelors of Science Degree in Finance. She is an enthusiast who is intrinsically motivated and so despite being a product of a humble household she has always been striving for excellence. Over the years she has displayed stellar academic performance by completing her secondary education with ten CXC subjects and an Associate Degree in General Studies. Since being at the University of the West Indies she has maintained her position on the Dean’s List while actively participating in the Rotaract Club and volunteering with the Hanover Hope Foundation. She has established herself as a leader and a role model to her peers. In her spare time she enjoys socializing with her peers, reading and listening to music. Romario Bartley is an accounting major. He plays the position of prop or second roem for the UWI Rugby Team and Liguanea Dragon Club. He has been awarded multiple silver and bronze medals and has represented the country in Canada. Studying Social Sciences, Management Studies, Plays Football, Represented the parish of St. Catherine when she was 13 in the under 15 parish team. She played one year for Portmore Strikers, captained Frasier Whip, and Barbican Football Club. In her first year playing for Barbican she copped the JFF Scholarship for Academics and Sports.